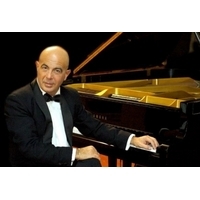 Roberto Santucci, born in Cagliari (Sardinia), is a pianist whose reputation both as a composer and as a performer is worldwide. Having graduated at the "Conservatorio di Musica" in Cagliari, he eventually improved his musical skills at the illustrious "Mozarteum" in Salzburg, being mainly influenced by musicians such as W.A. Mozart, F. Chopin and S. Rachmaninoff.